They keep saying that in 2011 “Pie is the new cupcake.” We’ll have to see about that, but for now I’ll add to the hype. Valentines day is just around the corner and if you need something that is 100% guaranteed to put a smile on someone’s face- I have it right here! These little sweetie pies are genuinely adorable. They’re also one of those things that look like tons of work and effort, but in reality they’re pretty quick and easy! So go ahead and impress people with your skills. Or just sit in a dark room and eat them all yourself in one sitting. We won’t tell, I swear. I have tons of variations shown below, as well as some options for fillings so if you really wanted to, you could make these super fast with store bought filling and dough. Homemade pie dough really is a cinch to whip up though, so if you’re not used to making your own, give it a shot! Start by rolling out your dough on a floured surface. About an 1/8 of an inch works well. Since you’ll be sandwiching two pieces of dough together you don’t want it too thick. If you’re making pops, you want to keep your hearts small- if they’re too large, the sticks won’t be able to hold them up. A 2-inch heart worked perfectly. You can use any filling you like, store-bought or homemade. Just keep in mind that these little pie pops are small so you don’t want huge pieces in there. I’m using canned raspberry filling in the picture below. Place 1-2 teaspoons on each cut-out, making sure to keep it at least 1/4-inch away from the edges. Otherwise it will all squeeze out and look messy when you put them together. If you want to be crazy like me, throw a little chocolate in there too. Nutella-banana pies would be yummy too. I imagined that when making these with no bananas in my house. A quick homemade apple is fantastic too- you only need one apple! Since these are tiny little pies that don’t bake for very long, grating the apple with a cheese grater works well. Remember to only fill half of your shapes with filling. Place a lollipop stick right in the middle, about 1/4 inch from the top. If you place it at the bottom that little pie will fall right off. Also, try to have relatively clean hands when handling the sticks or you’ll find your finished sticks will have brown spots where the grease baked in! Keep a little bowl of water next to you and use it to wet your finger and run it along that open edge. Do the same for another non-filled cut out and place it right on top of the filled one. Gently press down with your fingers to seal the dough together. Make sure to press it around that stick. take a fork and crimp all around the edges. This is done partially because it helps seal the edges and partially because it’s totally cute. You have some options for the tops. For my raspberry pies I brushed the tops with melted butter and sprinkled with sanding sugar. I decided to leave the apple pies plain so I could brush a glaze on after baking. Prick a whole in each pie as well, so that steam can escape and then pop them in the oven. They only bake for about 15-20 minutes and come out looking puffed and golden. Now..the apple pie. I wanted this one to have a glaze instead, so that can be whipped up while the pies are cooking. 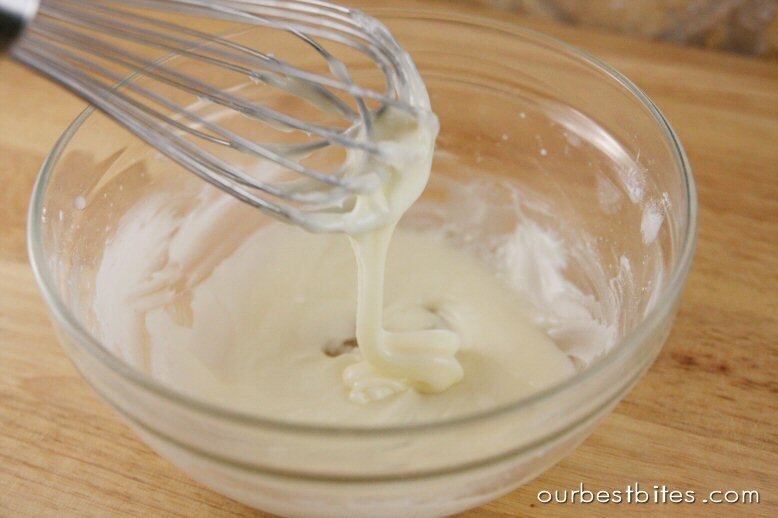 Super simple: sugar, butter, milk. These were definitely my favorite. When the pies are still warm, just spoon it on. It dries so it’s not wet to the touch so you can package these cuties. It makes them shiny and sweet and utterly adorable. 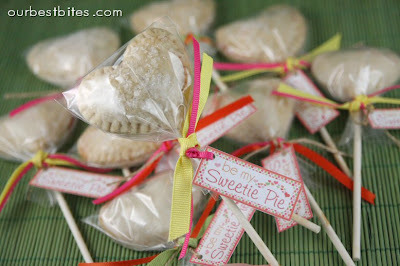 How could I NOT make tags that say “Sweetie PIE” on them?! And if I make tags, how can I not share them with all of you?? See the end of this post for a free download! I happened to have little 3″ cellophane bags that were exactly the size for these. Perfect for gifting! 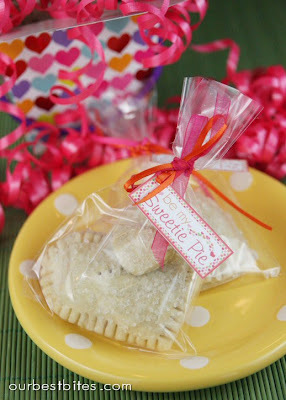 They look super cute in a little tin bucket for party favors too. Now, if you want to enjoy all of the cuteness of Sweetie Pies but without the Pop part, then fear not. Make hand pies! Hand pies are just little pies about the size of your palm. A darling little snacky pie. It’s obviously the same method, just without the stick. I used a 3 1/2 inch cookie cutter and one crust recipe made 6 pies. The look super cute with a tiny heart placed on top too. Just stick them in a little cello bag with a ribbon too. Pretty much everything in life is improved with a cello bag and ribbon. A Sweetie Pie Pie-in-a-Jar is pretty freaking adorable too. I just used a tiny 1″ heart cutter and layered hearts all over the top of the pie. And since I was doing labels already, I whipped some up for those too! You are going to have the happiest Valentines ever! Preheat oven to 375 degrees. Line a baking sheet with parchment or a silicone baking mat if desired. Bake pies for 15-20 minutes until barely golden brown. Cool for a few minutes and then transfer to a cooling rack. If glazing, gently brush or spoon glaze over pies while still warm. Cool completely before packaging. If desired, place in cellophane bags and tie with ribbons and labels. 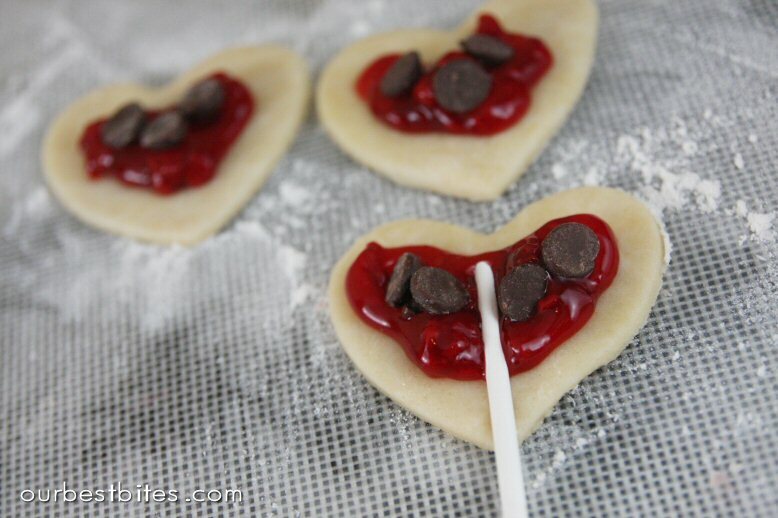 Also- if these look fun, you’ll probably love our Valentine Cookie Pops too! 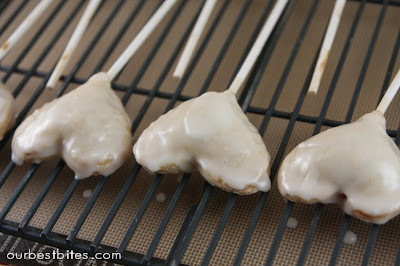 Woohoo for pies on a stick!! Love this idea! 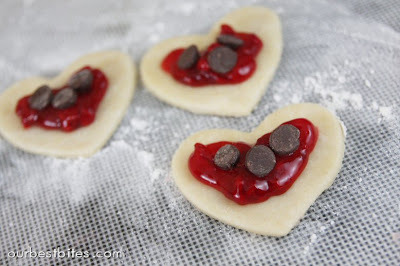 I have been trying to think of a Valentine treat to put together for my kids that wasn't candy or the usual cookies…this is perfect! So darn cute too! Thanks for the idea and the tags too! Oh my! I made this exact thing! I'm waiting to post my new Valentine's Stuff until Feb 1st hits (tomorrow, yay!). Of course, mine are not as beautiful…and adding chocolate chips. Well, that is just brilliant! I hadn't made pie pops before. I made a few mini pies this time with heart cutouts. Loved them all. I used premade dough and filling. So, I totally cheated but thought it was a good break in, as I've never made a real pie before anyway! As usual, your site totally inspires me, and shows me how to do things just a little more polished and a whole lot yummier! What a delight, finding these this morning! Love the printables too!! This is so sweet…thanks for sharing! It reminds me of the pies we ate as kids and I like that it's so totaly different as a Pop and not just cookies, etc. These are probably the cutest things I have EVER seen!You guys are so creative. We will definitely be making these! What a fantastic idea!!! And I just bought heart cookie cutters!!! And I love the pie in a jar!!!! Love IT!! Thanks so much! My question is: the sticks don't burn?? Nope Monica- they won't burn! It would be fun to add food color to the glaze for some pink pops! This might just have to be an activity for family fun night! Um. Ok. Did you somehow hear the conversation my husband and I had last night?!?! 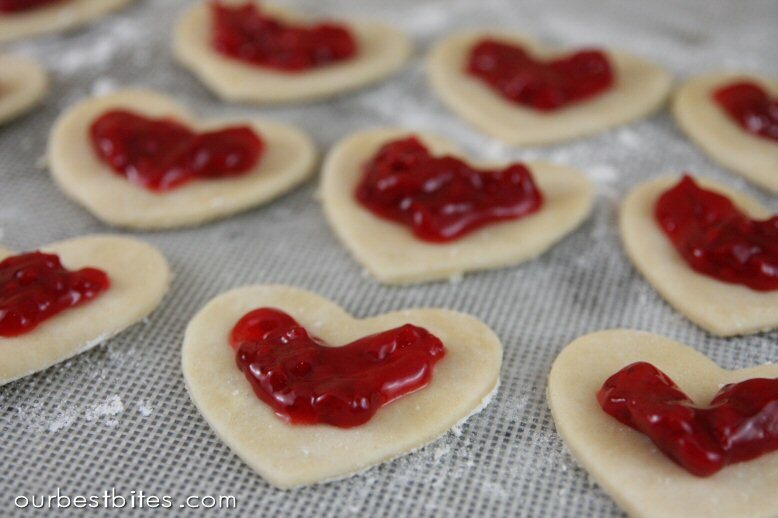 I was JUST telling him how I wanted something new and fun to make for Valentine's Day that is heart-shaped because right now I'm really sick of making sugar cookies. I am SO ready for something new and this is perfect! Seriously, so cute. 🙂 I'll be trying these soon. these look sooooo cute! and I can just imagine cherry pie filling with chocolate chips and a white glaze – almost chocolate covered cherry-ish! so what filling ideas do you have for someone whose husband doesn't like pie filling? help? OMG – These are soooo adorable! Crafty AND yummy! I too, was looking for something fun and a little different to make for the family for V-Day! I will be giving these a go – thanks for sharing! Hey Sara, I'm assuming that the small ones could work without the stick? I thought I had some, but I can't find them. Just want to double check before I ruin it, lol. THAT IS BRILLIANT! I'm jealous I didn't do it first. Great idea! I can't make these right now cause I just know I would eat every last one of them….but when I have some company….I'm gonna try making them. Wonderful presentation. It would make a wonderful table centerpiece! 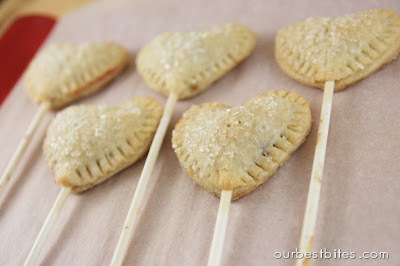 Ohmigosh these have to be the cutest down-homiest valentine pops I've ever seen. I mean, nuthin' says LOVE like PIE! Man, I was just staring at candy and cake stuff at the store, and wondering if I needed the lollipop sticks. I passed on them because I hadn't seen your post yet. Grrrrr. Now I'll have to go back. These are adorable! I just happen to have a bunch of sucker sticks too. Awesome. For Michelangelo, I would suggest googling recipes for pasties. Traditionally, Cornishmen would take these meat filled pastries into the mines for an 'easy to eat' meal. 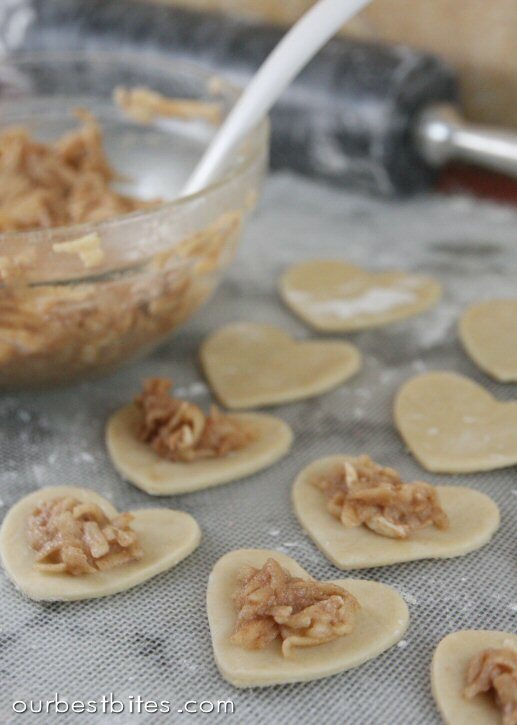 Bet you could find a filling that would work out great for a savory Valentine treat. Adorable! You guys are so creative. Thanks for sharing what a fun treat. The Nutella and Bananas are so good. I made some last weekend but used Crescent rolls (because I use crescent rolls for everything) and made them in heart shapes too. Drizzled chocolate and confectioners sugar on top. Yummy. I've been meaning to make this since I first saw it on Luxirare. I just forgot. I am loving the heart shape. Perfect for Valentine's! Great idea! I am kicking off my 14 days of Valentine's with these babies! It may be overkill, but I tinted the glaze pink and added a few red sugar crystals on top. I'm so excited for my husband to wake up and find them on the counter in the morning! Hooray for Valentine's Day! Could you use the butter pie dough (https://ourbestbites.com/2009/08/galette-panless-pie-any-flavor.html) for this, or would it be too heavy? I never have shortening in the house, but I am sorely tempted to buy some just to make this recipe. Combine all ingredients together in a large zip-loc bag and smoosh together until blended. Snip a corner of the bag and "pipe" the filling onto one piece of dough, then cover with another piece of dough and crimp as directed per recipe. 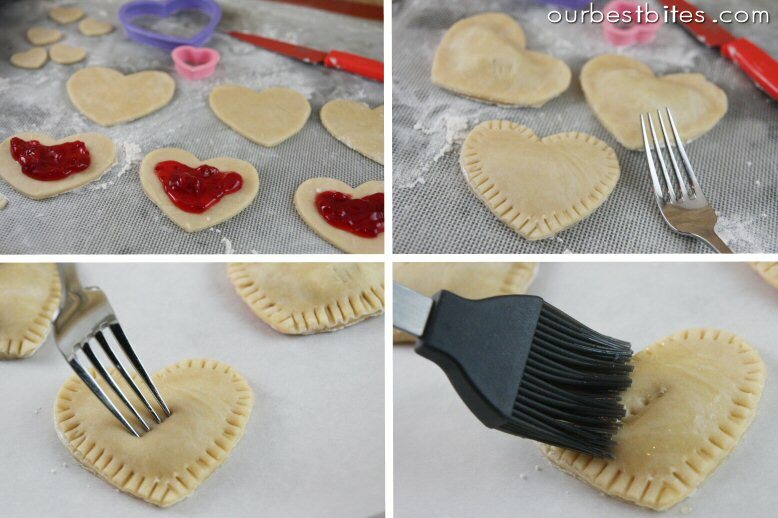 It says the filling is enough for 10-15 pocket pies, which are probably about the size of the large heart-shaped pies or maybe a little bit bigger. Also, best to crimp the edges really well and bake on a foil/parchment lined sheet with sides, since some people have complained of leakage during baking. I haven't made this filling before, but I might for Valentine's Day this year…what's a better treat than heart-shaped chocolate pies?? Jen I think butter crust would be fine. And thanks for the chocolate filling recipe- that sounds amazing! Seriously could anything be better than Pie on a stick!!!! Oh my goodness you guys come up with the cutest, yummiest, amazing wonderful ideas, and I absolutely love it!!! I can't wait to try these! I am the biggest pie lover and when I saw your pies in a jar you did awhile back I honestly thought to myself "What could be cuter than that!" and I think these pies on a stick come really close! Thanks for sharing all of your wonderful ideas and yummy recipes with us! wow! they look delicious what a great idea!! OH my DARLING!! Love this! What a fun Valentine's Day idea! Everything is cuter on a stick! 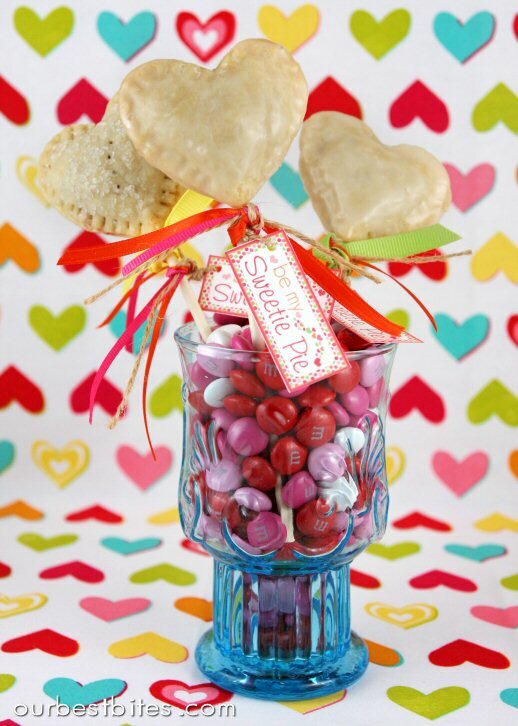 Love these and I think I'll be making these for my kids teachers Valentines. 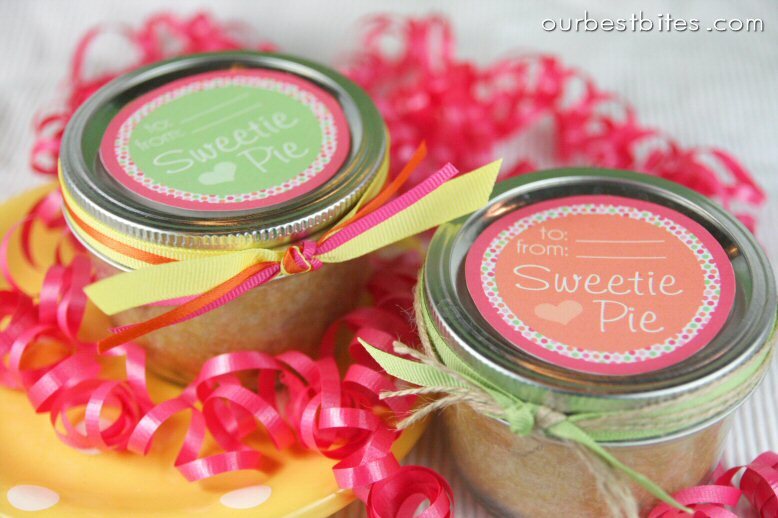 I did the pie in a jar for Christmas gifts this year and they turned out sooooo cute! These will be my sweetie's treat! Raspberry and chocolate sounds irresistable. Thanks for all your awesomeness! ohhh those are really cute! I was just going to make some with the kiddos because we are stuck in the house because of the weather. So cute! Made some nutella banana hand pies today. MMMM sooo good. Thanks for the idea! "Pretty much everything in life is improved with a cello bag and ribbon." Ha ha ha. Its so funny because its true! I love it! I made these today with leftover dough from making chicken pot pie and made a blueberry filling. They were so yummy! I have a question though. I know it isn't the season but I love pumpkin pie! Do you think this would work with pumpkin pie filling and shape them like pumpkins? These look SO cute. I love all the wonderful ideas you guys have! Weeeellll…..since you asked so nicely, I will be your sweetie pie. I will be sweet, and you can bring me pie!! 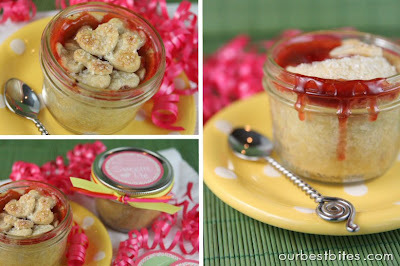 I love the hearts on the pie in a jar. Thanks for sharing! This is such a cute idea! I would love to read a tutorial on how you make your tags. I'm always wanting to add cute tags to food gifts, but I don't know how to make them. Love your blog! Thanks! Are pretty much all pie fillings equal here? I want to make these but my boyfriend does not have a sweet tooth at alllllll so I was thinking lemon meringue pie filling, would that work? so! 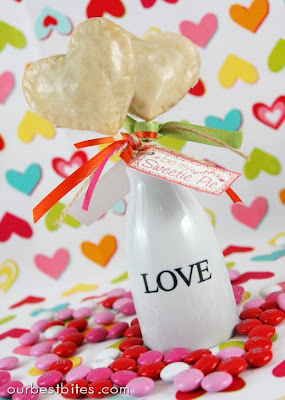 i totally made something like this and dubbed mine "pie potstickers" since i wasn't putting them on sticks and they also were the typically, half moon, pot sticker shape. If I give these as gifts to teachers should I put reheating instructions ? Maybe 5 seconds in microwave or just eat cold? If I am giving these as teacher gifts….should I put reheating instructions? 5 seconds in microwave? Or just eat cold? These are so adorable! What a creative idea. Love it! Love your blog, thanks for all the inspiration! sjs- yup 🙂 Just fine. I had forgotten about them! I've seen them (not in heart shape though) long time ago in http://luxirare.com/float/ but never tried to make them… Yours look great and yummi. I surely will make them! Do you think I could put jelly or nutella in the middle, or do you think it would get soaked up and be gone when they were baked?? OMG…. I bet the gooey cookie pie bite recipe would be YUMMOOOO in there!!! Totally trying that…. oooh and then you could even dip half the pie in chocolate… perhaps sprinkles… CUTE OVERLOAD!! I just want to make sure I give you credit. I posted a blog post on these, that I made after visiting your blog. yours are alot cuter and I gave up by the time I needed to put sticks in, I didnt want then to be to heavy, but they are cute. Your pictures are alot cuter also. Thanks for the idea. I'm new to your blog. So I made these today, but they turned out bad. They look great, but they just don't taste like pie. I rolled the dough almost a quarter inch thick and I think you need to stick to an eighth. Any thicker and the filling to crust ratio is so small it just tastes like pastry. oh well they will be a great center piece. What great ideas . . . will be tring some of these for my pie-loving sweetie this valentines day! I wonder if it would work with chocolate pudding for the filling. Mine didn't stay on the sticks! I am totally bummed 🙁 Did I miss something? I had my trusty Laptop right on the kitchen counter cooking with me and thought I did it perfect but the sticks keep falling out. Help please! These look amazingly delicious and absolutely darling! Featured them on my blog this week! Have a great weekend! Will Rasberry preserves or jam work? I'm so excited to make these for everyone at work! Sure you could use preserves. I would look for the Smucker's "Simply Fruit" type- and if you can find fresh raspberries this time of year without spending a fortune you could add some of those too- just because jam can be really sweet. My crust came out a little tough and some of the filling came out of a few (I have a lot to learn about baking!) but overall I think they were cute! Love this!! I'd like to make them for my kid's party but I wonder… can I make them days ahead and keep them in the freezer? If so, should I freeze them before baking in the oven or baked already? Serendipity- freeze unbaked and you can just pop them in the oven straight from the freezer. No need to thaw! These are so so good-I made them last week and was blown away at how CUTE nad easy they are! 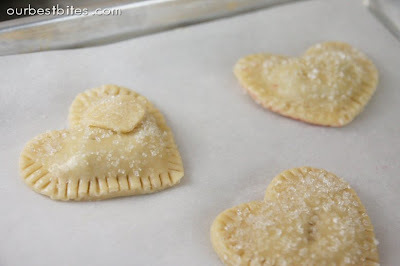 Question-has anyone tried to make these ahead of time and freeze them? And if so, should I freeze them after I bake them or frreeze them raw? I am making 50 apple ones as a baby shower favor. Yes Becky, they freeze perfectly! Get them all ready and then freeze them un-baked. I place them all on a cookie sheet in an even layer and flash freeze, then you can stack them between layers of waxed paper in an airtight container and store in the freezer. You don’t have to thaw before baking either, just pop them in the oven frozen- the baking time is only increased a tiny bit so just keep an eye on them. THERE SOOOOOOOOO GOOD IM MAKEING MORE!!!! P.S THIS IS JOSH AGE 10 I LOVE MAKING THEM WITH MY MOM :D!! First, I LOVE Valentines Day and am happy to see someone else who enjoys it as much as I do! Secondly, why are these the stinkin cutest things of my life?! Seriously ladies, these are adorable…I can’t wait to try them out!! Hi! this is such an adorable idea. 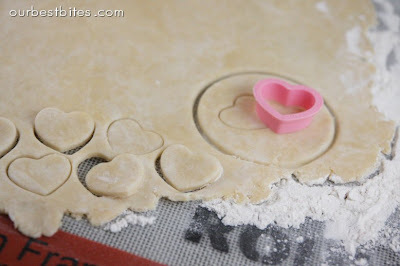 I’m actually going to do this, but instead of hearts, I’m using a half moon cookie shape. My question is: Instead of the glaze, I want it to be a cake pop pie; a pie pop? This means I’d have to dip the pie into candy melts or melted chocolate. As long as the pie pops are cooled enough, do you think they’d survive being dipped and then immediately cooled? I’m not sure sabeena. You can try it out, but just be really careful because the pies might slip right off the sticks! I am having trouble printing out the sweetie pie labels any suggestion? How long in advance can I make these for a party? They can be frozen for a few months and refrigerated for a couple of days. This are so preety!! I just saw the picture in “Whole Kitchen” and directly come here to see your adorable sweetie pie!!! I’m sorry if I didn’t make myself clear. I was going to use a 3 1/2 cookie cutter to make 6 like you 😉 I just want to make sure they all have the same amount of filling. Did I mention how excited I am to make these!!! I honestly don’t know an exact measurement. Just use a Tablespoon to spoon it on so you can keep track of a good amount and take it from there. Good luck! Wow! So adorable! My 10 year old son has a goal of being a master chef when he is older. At Christmastime, he received one of those mini pie makers from grandma. So he made some pies and my husband took them to school for his co-workers and students. 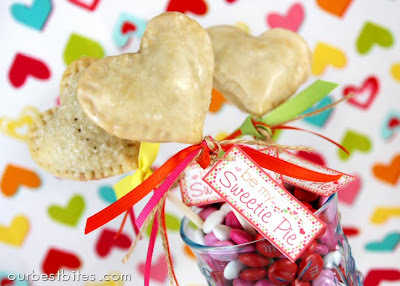 Now the students have suggested other pie fillings and this is an awesome idea for our lil chef to make Valentine’s pies! He’s going to be so excited! Thanks for the great idea!!! I may have missed it, but what temperature do you bake these at? You want to bake them at the temperature your dough calls for. For our recipe, it’s 375. This is a great idea! Have you made a chocolate pie filling for these pops? If so, would you mind sharing? If i’m making 12 of the pie pops with the homemade dough on your blog, (the butter one) approximatly how much dough do I need to make? My sister and I made these last night for a birthday party and they were so easy! We did all apple. I think we didn’t put enough glaze on them but served with a side of vanilla ice cream I don’t think anyone will notice. Thanks for the idea ladies. Thank you so much for sharing these. I already bought apples. I can’t wait to do them. JUST made these again! Made them last year & they were a huge hit with the hubs so I made them for him again this year. He LOVED the apple so I just made him 12 apple hand pies. Thanks again ladies! Love these so much! I cheated a little and used a chunky homemade (not by me though;) apple butter and added a little caramel. They were absolutely perfect for our V-day celebration! Your blog has given me courage to attempt things I probably never would have, like pie crust from scratch! Who knew it could be so easy???! I made the mini hand pies today for a v-day treat for my family (including your pie crust recipe). I can’t wait to try the finished product!! 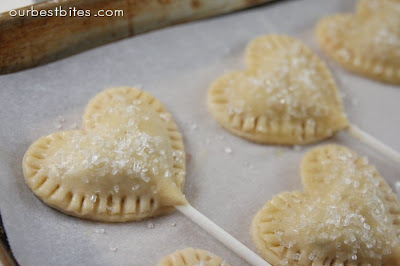 Making the heart-shaped applie pie pops right now and my house smells amazing! Even made the glaze, can’t wait!!! Great! I made them for my sister’s daughter! She apparently gave them to her boyfriend! I gave them to my kids! Just made these and they didn’t turn out. They taste like pie crust. Anyone know what I could have possibly done wrong? Try some with only a little filling and some with filling gushing out of them…..
Hi – I’m trying to solve my problem. I love making Pie Pops – I generally make them for family and friends. My problem is I would love to make these a day or two before but my crust is great the day I make them but then gets to soft as time goes on. How can I prevent that – is there anything you can do to keep your crust – crispy/firm for a couple days? Any help would be appreciated. 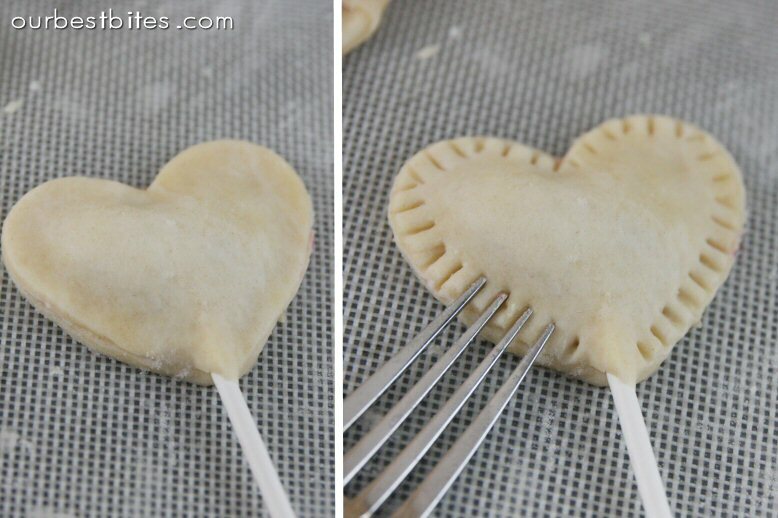 Honestly- I think pie pops are really just best fresh!